Berg Adventures has added a brand new Patagonia trip to our long list of amazing international destinations. The glaciers, granite towers, lakes and grasslands of Patagonia in southern Argentina and Chile offer some of the premier adventure trekking in the world. From the rich and engaging culture of the city of Buenos Aires to the literal southern tip of the Western Hemisphere, the port city of Punta Arenas on the Straits of Magellan, this new Berg Adventures trip will traverse some of the earth’s most unknown and fascinating landscapes. 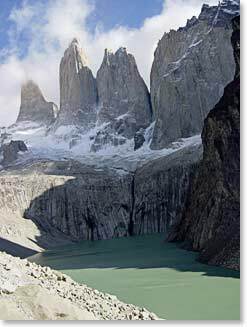 The heart of our trip will be the days spent completing the classic “W” trek in Chile’s Torres Del Paine National Park. Before reaching the UNESCO Bio Reserve of Torres del Paine, we will marvel at the oversized grandeur of Argentina’s Glacier National Park, where ice from the largest non-polar glaciers in the world spills into cold pristine lakes and where awesome spires such as Fitzroy pierce the sky. Our trip will end literally at “the end of the earth”, South America’s lands end at the edge of the Southern Ocean. We are also considering the potential for an extension to the program that will involve a crossing of the famous Drake Passage and a few days of exploration of the icy landscapes and hardy wildlife of Antarctica. Stay tuned for more info on this amazing opportunity. Learn more about the trip through our recent Patagonia exploration dispatches. Read the trip description and itinerary for more details. For more information about this exciting trip, feel free to contact Leila or Kristy at our Berg Adventures office.